While normally not a fan of modern art, I nonetheless visited the Tate Modern today, and had a pretty good time. Converted from the former Bankside Power Station in the late 1990’s, at the same time several other attractions opened on the South Bank (including the new Globe Theatre and the Millennium Bridge), the museum features international modern art from such artists as Andy Warhol and Salvador Dali. It’s the inclusion of one of Dali’s works, Lobster Telephone, in the museum’s collection that particularly interested me, because of its, um… unique… style. 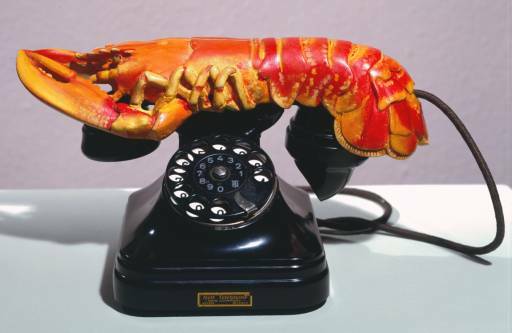 For those not familiar with Dali’s work, he was a very well-known surrealist, and this work, in which he placed a lobster on top of an old style telephone and took a picture of it, does not disappoint. Unfortunately, I wasn’t able to locate the work in the museum, though it was featured in the museum’s movie on the fifth floor, and is definitely in the museum’s collection. I’m really not sure what draws me to this work, but it might be its combination of simplicity and randomness. The first time I saw it, I almost laughed because it was so unexpected. I was disappointed that I couldn’t find it, but it didn’t ruin my two hours at the museum, which I would recommend to anyone traveling to London. Whilst touring the national portrait gallery, one notices a few immediate similarities: first, virtually all subjects are men. Second, all subjects are white. Within these two parameters, however, the paintings were fairly diverse. Subjects ranged from masters of the arts to pioneers of the sciences and then, predictably, to the useless courtiers. Among these portraits, one caught my attention. 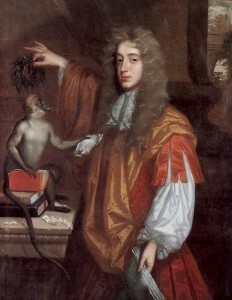 The 2nd Earl of Rochester, John Wilmot, proved to be a very interesting character. Known for his poetry, Rochester’s verses ranged from the deeply philosophical and biting satire to obscene sexual fantasies. Charles II was at times one of Rochester’s closest allies and bosom buddies, for both indulged in similarly licentious and flamboyant social lifes, but at other times proved to be the direct target of Rochester’s biting wit. Given these two extremes, it is easy to see why the “Merry Monarch” Charles II endured a strong love/hate relationship with Rochester, banishing him from Court about once per year. Rochester died at the age of thirty three. The cause is believed to have been venereal disease. After being a staunch atheist his entire life, Rochester converted to Christianity on his deathbed, after he overcame a long torrent of alcoholic abuse. Rochester’s portrait, like the poet himself, is deeply satirical. The portrait’s inclusion of a monkey, which is squatting on a pile of books handing Rochester a mangled page of verse, proves to be a deliciously self-mocking bit of wit, for Rochester then bestows upon the animal the laurels of a poet. This commentary of Rochester’s proves to hold true to the poet’s general outlook on life. In his most popular poem, and easily most controversial, “A Satyre against Reason and Mankind,” Rochester condemns the “reason” of mankind and praises the instincts of animals, concluding them to be logical, whereas men use their wits and reason out of fear and lust for power.